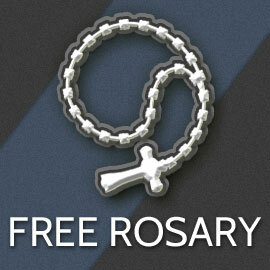 Now it’s easier than ever to bring a Rosary Army Workshop to your Church, Group, or Home! Please buy a DVD and support Rosary Army! Click here for a PDF Promotional Flyer to print out and share with others to help spread the news about the Rosary Army Virtual Workshop! We regularly hear from people who want Rosary Army to visit their parishes or groups, but can’t afford to help us get there, or from people who would simply like to teach themselves or a group of people how to make all-twine knotted Rosaries themselves. Bonus Feature: Pray the Rosary along with the DVD! Rosary Army president and co-founder Greg Willits shares his powerful testimony of how the Rosary brought him back into the fullness of the Catholic Church, and what inspired him to start making all-twine knotted Rosaries to give away to whoever needs one. Since co-founding Rosary Army during the Year of the Rosary, thousands of people have listened to his free multimedia talks on Rosary Army’s website. Now Greg presents a brand new talk especially for this DVD presentation. The Power of the Rosary traces the history of the Rosary as well as provides a detailed explanation of the essentials of meditating on the Mysteries of Jesus Christ’s life while praying the Rosary. A great way to introduce people to the Rosary! One of the primary goals of Rosary Army is to not only give a free Rosary to whoever requests one, but to teach as many people as possible how to make their own all-twine knotted Rosaries to give away. Since going online, thousands of people have viewed Rosary Army’s online video instructions. Now you can share new and improved instructions anywhere there is a DVD player. Featuring crisp and clear images and sound, the new video instructions will teach you or your group everything you need to know to produce your own easy to make all-twine knotted Rosaries to give away to others! Pause, rewind, fast forward, and learn at your own pace. You can even view each step in slow motion to make sure you master all of the techniques needed to make beautiful all-twine knotted Rosaries to give away to others. And now you can help teach other people how to make them, as well, by sharing the Rosary Army Virtual Workshop DVD! Great for homes, youth groups, Church libraries, and parishes! Make Your Own Two-Twine and Ladder Rosaries! An often requested feature is the inclusion of a never before seen short video on the DVD explaining how to make advanced knots like the ladder Rosary and two-twine knots. These make great gifts for weddings, Baptisms, and other special occasions. A Bonus Feature on the Rosary Army Virtual Workshop DVD is the inclusion of an on-screen Virtual Rosary. Pray along at your own pace as the prayers of the Rosary are recited while each knot is highlighted as you progress through the meditation. This DVD now provides even more parishes, religious classes, and individuals with greater access to instructional material previously available only on the Internet. Proceeds of this DVD go directly to funding Rosary Army and to help us to continue making, praying, and giving away all-twine knotted Rosaries, and teaching others to do the same.